Long after preparing Caramel Apple Chimichangas and sharing a recipe with you, my family and I have enjoyed their taste, with the same passion. 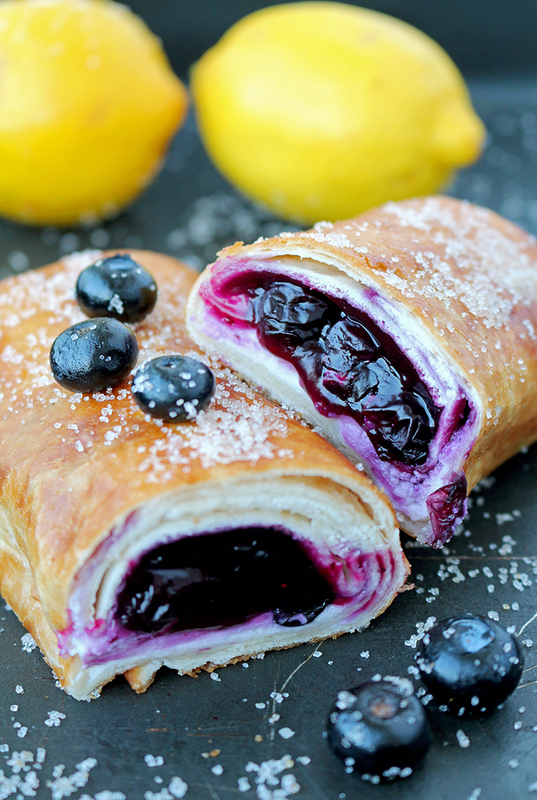 Now, I‘ve decided to make a small change, to use fresh blueberries and make perfect Blueberry Cheesecake Chimichangas. We all like blueberries, so I often prepare blueberry desserts, like Blueberry Lemon Cheesecake Cookies and Strawberry Blueberry Icebox Cake. I like cream cheese and fruit combination – it‘s so refreshing. 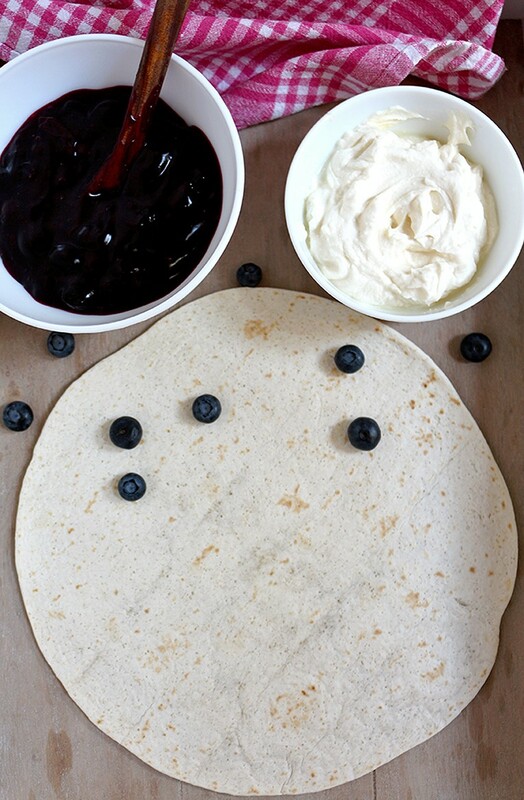 My family and our friends and their kids all love these delicious tortilla wraps, filled with cream cheese and homemade blueberry sauce. Even my son, who prefers chocolate desserts, loves them. 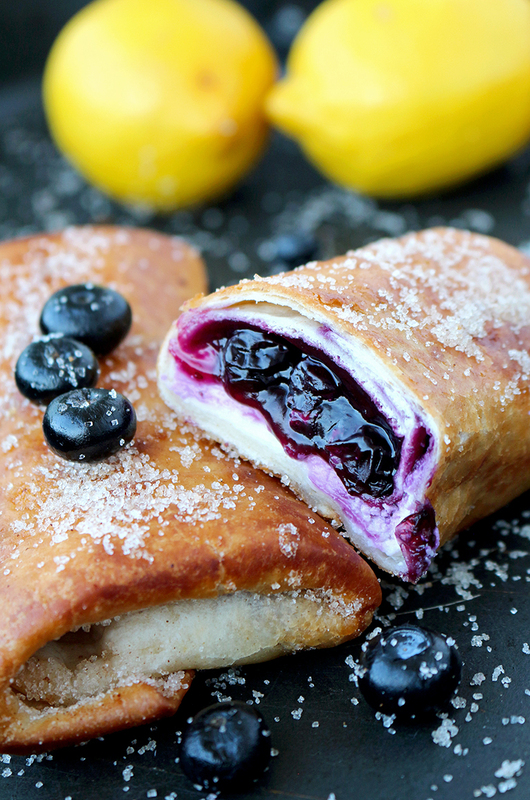 Blueberry Cheesecake Chimichangas are special because they are made with homemade blueberry sauce. If you still haven‘t tried any sweet chimichangas, try these, I‘m sure you‘ll love them. 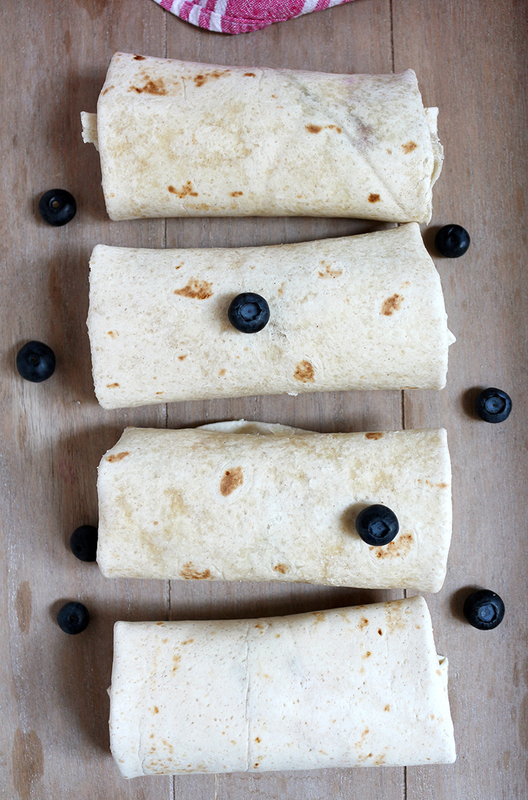 So, get busy, make these cute wraps and treat yourself with a perfect taste of Blueberry Cheesecake Chimichangas. Do you like sweet chimichangas? 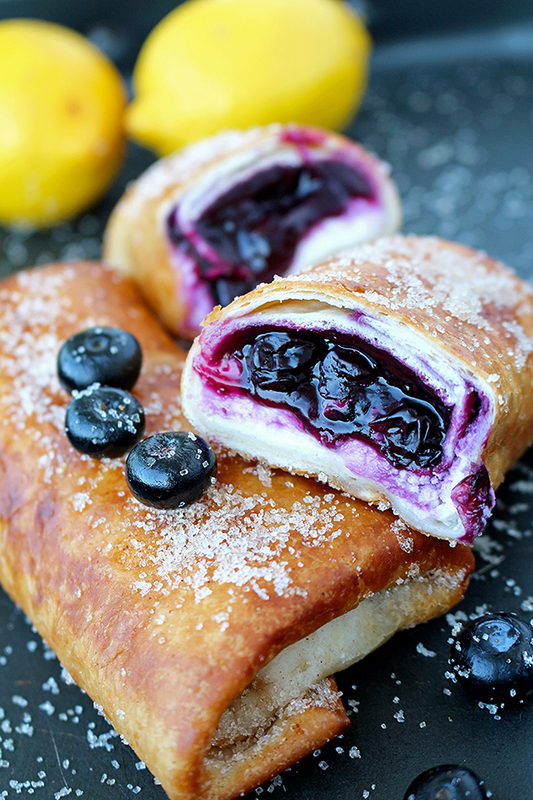 Chimichangas with cream cheese and blueberry sauce – a recipe for perfectly tasty Blueberry Cheesecake Chimichangas. Put blueberries, sugar, 5 Tbsp of water, lemon juice and lemon zest in a medium pan. Cook for 10-12 minutes on medium heat. In a separate, small dish, put 2 Tbsp of water, corn starch, vanilla and salt and stir them, then add to the blueberry mixture in the pan. Stir and cook for 20-30 sec. Remove from heat and leave to cool completely. In a medium dish mix cream cheese, sugar and vanilla until it gets creamy. In a smaller dish put sugar and cinnamon and stir. Leave aside. Put cheesecake filling on the lower third of each tortilla. 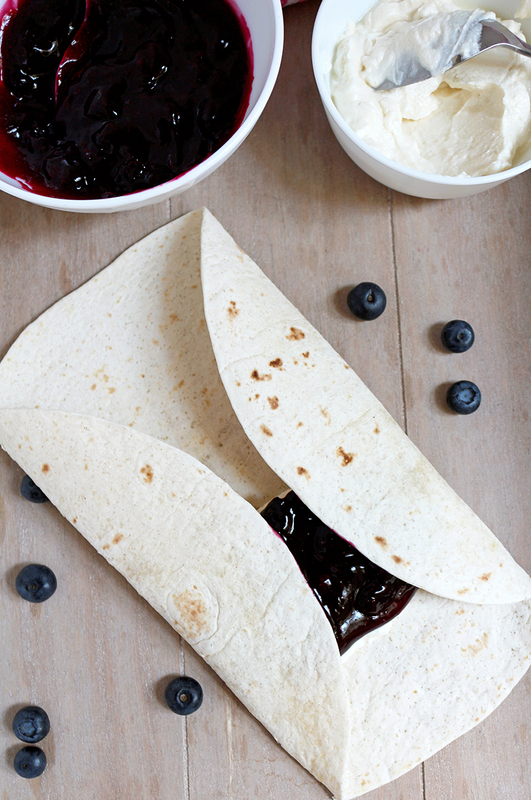 Put around ¼ cup homemade blueberry sauce over cheesecake filling. Fold the two sides of each tortilla toward the center and roll into chimichanga. Use toothpick to secure it. Repeat the same with the rest of the tortillas. Fry chimichangas in a frying pan with hot oil until golden brown and flip them, as needed. Transfer the chimichangas to the paper towel on a plate to drain for a minute, and then roll them in cinnamon and sugar mixture. Don‘t forget to remove the toothpicks. It is best to be eaten the same day. Shared with my readers and pointed them here for directions. Thanks for the recipe! This one has me drooling!